The Glebe Estate comprises an intact community whose history goes back to the middle of the nineteenth century. So remarkable was the survival of a community so close to the centre of Sydney that it was purchased by the Federal Government to prevent the demolition of its buildings and the dispersal of its inhabitants. What is commonly called ‘The Glebe Estate’ is in fact three portions of the original land granted to the first Anglican priest, Richard Johnson, in 1790, namely the 400 acres known as The Glebe or farm for the maintenance of a church and school. In 1828 all but three lots were sold by the Church of England at public auction. Two of the remaining three lots were given to St Phillip’s, Church Hill on the present York Street in the City. The third was given to the chief priest or archdeacon, who later became the bishop, and was henceforward known as Bishopthorpe (‘bishop’s village’). These two farms were subsequently subdivided and leased as building lots, St Phillips in 1842 and Bishopthorpe in 1856. 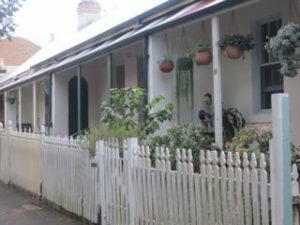 The first houses in St Phillips probably resembled those from the 1840s that still survive in Glebe Street, the earliest anywhere in Glebe apart from the Georgian mansions of the great Glebe estates to the north. Similar houses may still be found in the oldest parts of Darlinghurst, for example. Most of these were eventually replaced by terraces during the 1870s. Some other early housing that had deteriorated was replaced by Art Deco duplexes and semi-detached cottages during the 1940s and 50s. St Phillips was always more closely settled, with housing for workers in the local industries built by wealthy Glebe landlords. By contrast, the lots in Bishopthorpe were larger, with longer leases. Only two houses could be built on each lot, and timber construction was forbidden. Consequently the houses were more substantial, and virtually all of them remain. After the depression of the 1840s development continued steadily on the Estate from the goldrush to the building boom of the 1880s, by which time it was completely developed. It forms an intact unique record of colonial architecture for the third quarter of the nineteenth century. In addition, Jane Harden, Bishop Barker’s wife, insisted on broad, tree lined streets with names derived from the Lakes District, home of the Romantic poets who were her friends. Bishopthorpe resembles a country town rather than a crowded inner suburb. As the leases expired, all the occupants became tenants of the Church of England, except for about 10% who purchased their houses. There were 723 dwellings and twenty seven businesses, constituting about 20% of the total number of dwellings in Glebe. By 1970 the condition of the houses had deteriorated. The Church had demolished and rebuilt some houses after the War, but was unwilling to expend funds on them, and they were in such poor condition the income was small. The situation was scandalous, at a time when there was much talk, in Australia and overseas, about the fate of the older inner suburbs. The population sank to 2500. Opinion was divided about what was the best solution. In some parts of the world, especially Europe, the inner areas, often even older than Glebe, had been devastated by bombing during the War. In any case they were thought of as slums, and were often cleared for high rise apartments and expressways. The Church and the Government both thought this was the way to go, and until it looked more closely, the newly formed Glebe Society was inclined to agree. However, by 1970 this process, euphemistically called ‘urban renewal’, had begun to get a bad name. Demolition displaced whole communities, and highrise brought a flood of unexpected social problems. As today, developers were chafing to get their hands on old buildings and pull them down, and much fine architecture had been lost. The Glebe Society did a study. Beneath the peeling paint, leaking roofs and grime were intact historic streetscapes housing a community generations old. A reforming Council took the study to the newly elected Federal Government, which was feeling its way toward methods of renewing Australian cities. The new Department of Urban and Regional Affairs, under the radical leadership of Tom Uren, decided the Estate could be rehabilitated, as was happening rapidly to private dwellings, rather than demolished. In one stroke, the dwellings in a key inner city area could be saved, their kitchens and bathrooms modernised, their accommodation extended, the intact community saved and increased, and the beauty of the historic streetscapes revealed. It was a new concept of urban renewal, perhaps better called ‘urban rehabilitation’, and it was so successful it served as a model for other projects such as Woolloomooloo in Sydney and inner areas in other cities, most notably Bologna in Italy. The Commonwealth paid $ 17.5 million in 1974 ($21 000 per dwelling) and rehabilitation cost a further $18 000 per dwelling. The Federal Government initially planned to have the entire Estate rehabilitated by 1979, but the defeat of the Whitlam government meant that by 1984 less than a quarter were finished. The two governments signed an agreement in 1985 transferring the entire Estate. The Department of Housing completed the rehabilitation, but to its own plans, leading to a total population increase of 3 000 persons, the largest increase since WWII, and likely to remain so. Where possible the houses were given extra bedrooms as well as new kitchens and bathrooms. The Department team, led by John Gregory, also designed infill where houses had been demolished, and built 115 units for seniors, who then vacated their original houses. The increase was almost entirely families, and included a high proportion of children, so the schools filled up and the demographic pattern of Glebe shifted youthward. The Department also provided an occasional care centre and a youth centre after consulting with the Society about social needs. The transfer was not without its problems. Squatters moved into unrenovated houses, and the resulting publicity probably gave the project a much needed fillip. Theft of items from the houses under rehabilitation was a major problem. The design and workmanship of the new and renovated housing was variable. Open space was in short supply, and maintenance continued to be an issue. New tenants were vulnerable people who were left without sufficient support. At various times this led to problem behaviour from some people, mainly youth. On several occasions the various agencies had to be called together so their resources could be properly coordinated, and the University of Sydney helped by funding a social worker to organise and coordinate programs. These measures have been largely successful. The Estate has its own active tenant group. At the same time the Department of Housing took responsibility for formerly Department of Main Roads affected properties in the Lyndhurst area, and the same team constructed infill and rehabilitated houses there as well. There was also some preexisting social housing, and the Department has bought more. Consequently, despite considerable private construction and conversion of industrial sites in Glebe the proportion of social housing remains at about 20%. Currently Glebe provides a major proportion of social housing for families in the inner city. It has many other unique features, because a significant proportion of public tenants were previous tenants of the Church or squatters, and the family accommodation has increased Glebe’s ethnic diversity, which previously comprised mainly Southern and Eastern Europeans. Click here to read An extract from The Whitlam Government, 1972-1975, E.G. Whitlam, Penguin Books Australia, 1985. I have been a resident in Glebe since my childhood, sharing a home with my mum and bother in the public estate area. I am proud to now be a member of the Glebe community once again, now with post graduate education and vast array of experience… yet I owe my foundational life lessons to the people and community I grow up with. It concerns me that the State Government now plans to demolish many of the public housing homes and build profit making high rise units. Could you please let me know if you know anything further about this and whether the Glebe Land (Appropriation) Bill still holds any significance or legal defense for preventing this from happening, or at least prioritising the needs of its community member first. Thanks heaps for your help.